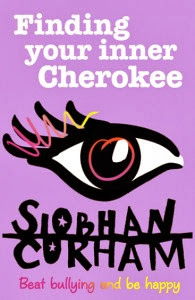 You may remember that I reviewed Siobham Curham's Finding Cherokee Brown in the summer. If you do, you'll know that I absolutely raved about it and was particularly impressed with the way the book handled the idea of bullying. I still maintain that I wish that book had been around when I was a young teenager, and now there's another book I can say the same of! And as today is the start of National Anti-Bullying Week, this seemed the most appropriate time for this post. When Siobhan Curham offered me the chance to read her latest offering in advance of the publication date, I jumped at the chance. Finding Your Inner Cherokee is an e-book full of first-hand accounts, techniques and exercises designed to help victims of bullying find their own way of coping. We all have a part of us which is "happy and care-free and strong", like Cherokee in the novel once she manages to overcome the struggles she faces at school. Hopefully this book will do something towards helping other people feel that they can be these things again. Using some of the ideas from the novel, this book is designed to "reassure and empower victims of bullying" and I have to say that I can imagine it doing exactly that. Not only is it filled with lots of diverse case-studies to reinforce the number one truth of bullying (that you are not alone), Siobhan shares her own personal experiences which I find really helps the reader connect with the material on a more intimate level. It feels more like a trusted friend or parent is talking you through ways to cope with the struggles you're facing, rather than a distant self-help author trotting out a load of cliches. The best thing about this book is that it doesn't molly-coddle the reader. It doesn't encourage you to feel sorry for yourself and it isn't unsettlingly saccharine like some advice guides aimed at young people can be. Its honesty about the sad facts of bullying is bare-faced and this allows Curham to offer advice which is equally as straightforward. I particularly like the emphasis on physically writing out problems as a means of purging, and this is something that I personally have been doing for years to make myself feel better - trust me, it works. The only time I ever write in the diary I swore I would keep every day is when I need to vent and yes, reading it back makes me seem really angry and depressed all the time but when I finish writing, it's like a weight has been lifted. I'm glad to see that I'm not the only one! My personal favourite of the exercises in the book is the idea of 'power tweets'; a powerful statement of 140 characters or less (sadly, the way most people communicate these days) to reinforce ideas that you might be struggling to make yourself believe. These can be useful not only to build the confidence of someone being bullied, but also for general inspiration if you're feeling a bit down or need some motivation. This isn't the only technique from the book that I'll be utilising in my own life. Finding Your Inner Cherokee is available now to coincide with the start of National Anti-Bullying Week and best of all, it's FREE. I think this is great, as it means that anyone and everyone who needs the advice and support this book offers can access it. Exercises to build confidence and exorcise negative feelings are followed by techniques for bully-proofing your life, and I feel that people of all ages and in all situations would benefit from the practical advice in this book. Bullying is a very serious issue that almost everybody has to deal with in one way or another throughout their lives. It isn't just limited to playground teasing and unfortunately isn't something that automatically stops as soon as you leave school. It can come in many forms from a variety of sources, but it is never okay. I'll end with a power tweet taken straight from the book because it applies not only to bullying but to an awful lot of situations and is something everyone should be reminded of: "Other people have got through this, and you will too." Those words will mean something different to everyone who reads them, but something will have sprung to mind. Stay strong.